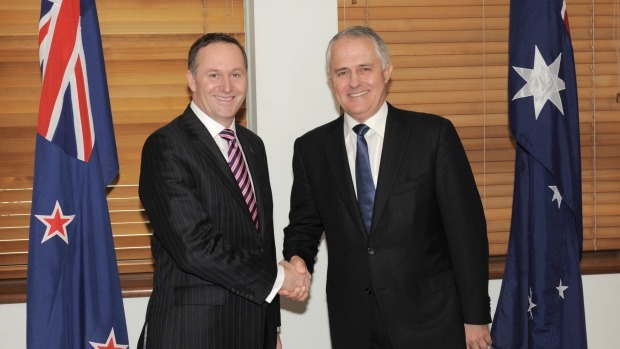 Australian prime minister suggests John Key is bit of a ‘role model’. 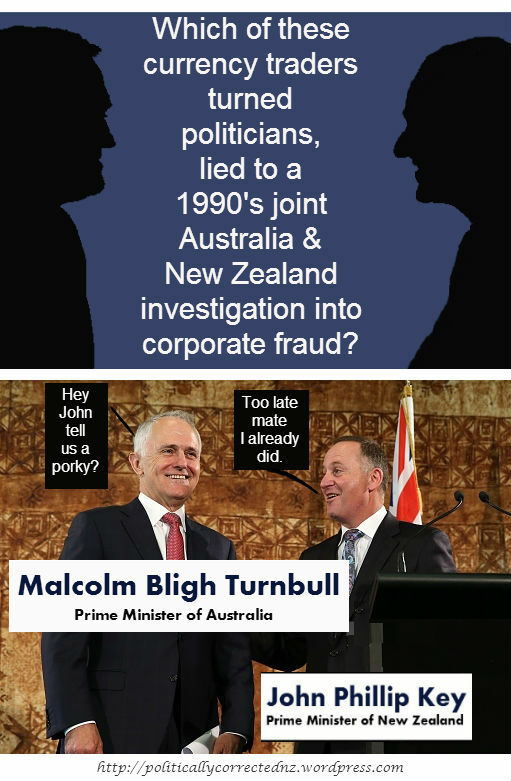 Would Turnbull and Obama think as positively about Key if they knew Key had lied to an early ’90s trans-Tasman investigation into high flying corporates on both our shores? 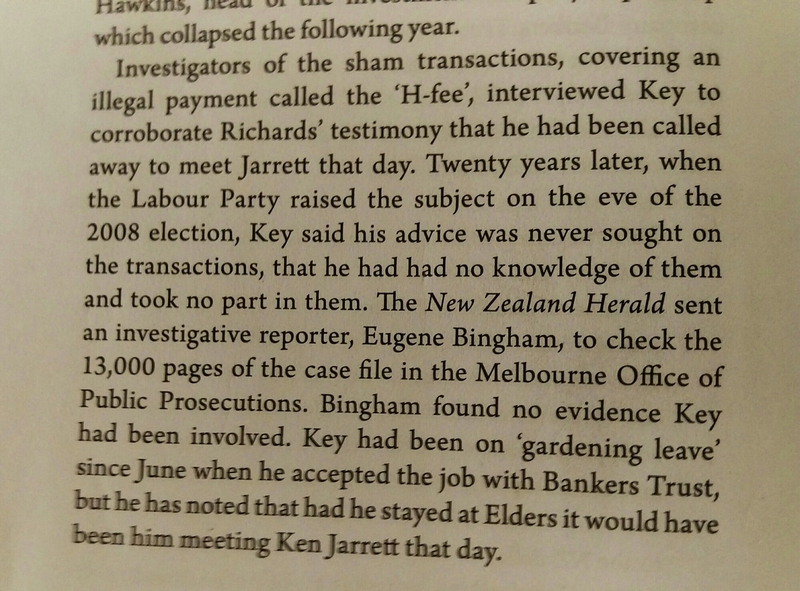 Key was interviewed by Australia’s (now defunct) National Crime Authority and New Zealand’s (then newly established) Serious Fraud Office in May 1991. The evidence he gave to the investigation included a dated timeline for him leaving one job for another. However with a little light shed on it, it’s easy to see this timeline is an impossibility. 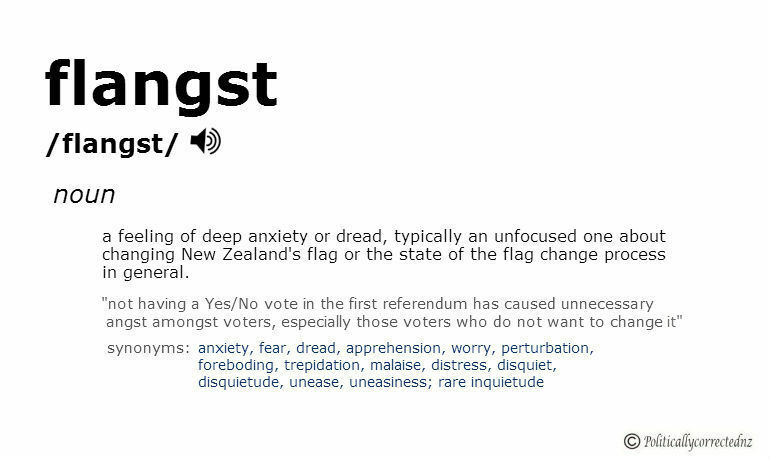 a feeling of deep anxiety or dread, typically an unfocused one about changing New Zealand’s flag or the state of the flag change process in general. 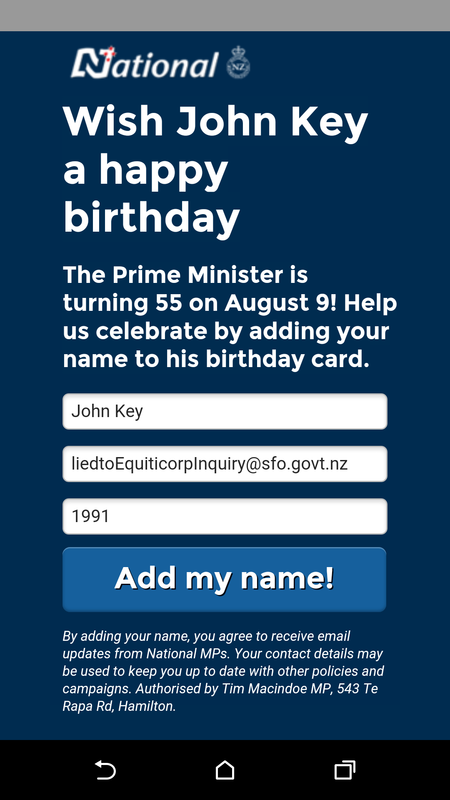 Newly launched entertainment and celebrity site SCOUT provided it’s audience with a much lauded first day exclusive on Monday which turned out to be little more than footage of NewstalkZB radio host and TVNZ’s Seven Sharp presenter Mike Hosking vacuuming his Ferrari. Yes, you read it right. 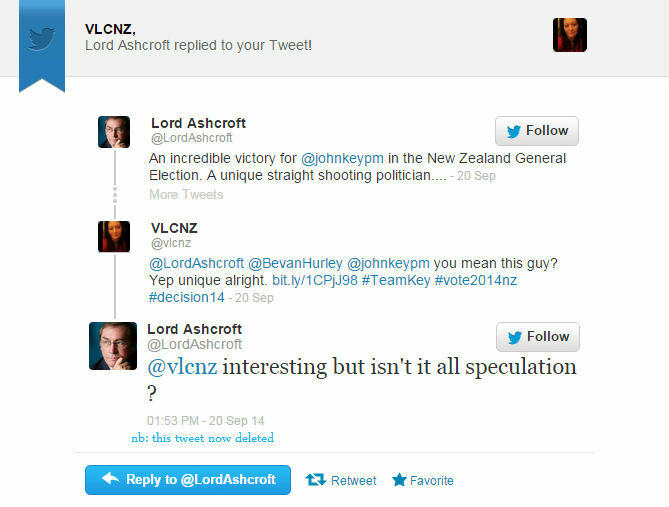 New Zealand’s highest paid broadcaster vacuuming his car is a not just celebrity news to SCOUT, the knowledge is so titillating it needs to be delivered to us an exclusive. 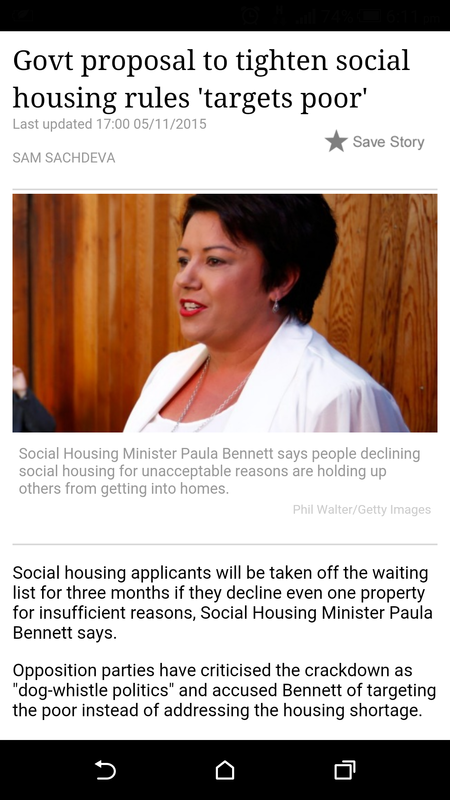 If this exclusive wasn’t such vacuous tripe you’d be forgiven for thinking Rachel Glucina and her SCOUT co-owners Mediaworks had taken out shares in a vacuuming cleaning company and were about to launch nightly SCOUT TV infomercials for their very own oh so sucky-motor. However its not the mindblowing numbness of SCOUT’s very first exclusive that is the point of this post, rather it’s the sexism that accompanied it. Glucina as author of this dust bunny drivel, needs to lift her game if she hopes SCOUT to have any longevity. 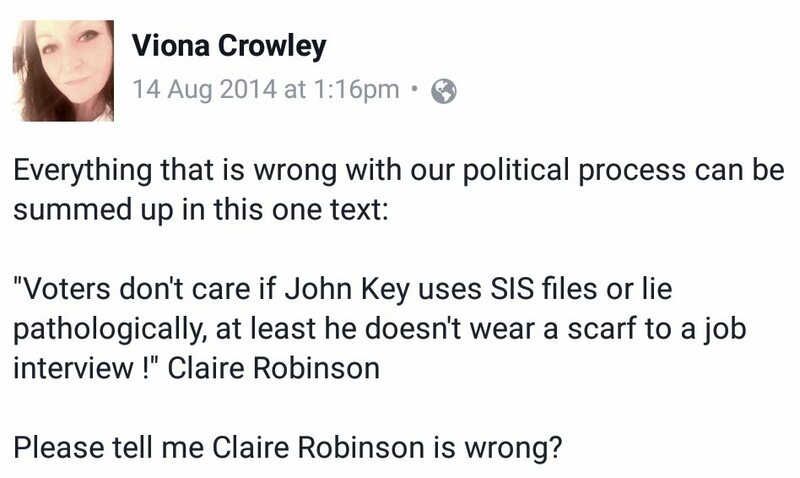 For the record, saying Hosking is not above ’embracing his inner cleaning lady’ is sexist and unnecessary. Men actually do clean and for the most part the majority of them don’t need to lower themselves from the lofty status of male to the lowly status of female to pick up a hoover. 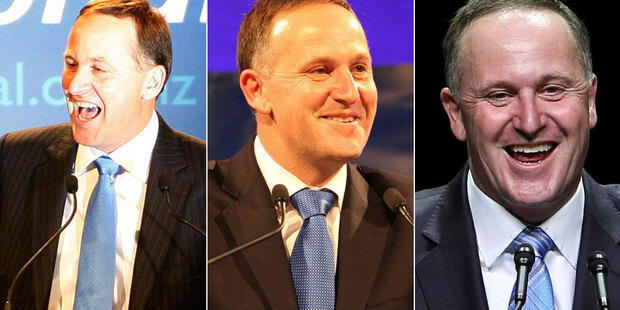 If this is the level of narrative and content SCOUT hopes to provide, then I can’t wait for it’s close-up of Key the Elder trimming his nose hairs and Glucina’s exclusive interviews with each of his nose hairs for their unique take on the inner workings of Prime Minister John. Navel Gazing with Toni Street – a lesson in trust. A diet requires a variety of food groups. Yet whenever healthy eating is discussed in the context of legislating for better food sources in our supermarkets, or a new study is published suggesting we need to take a closer look at what is on our shelves, people, often ignorantly, leap on to the “personal responsibility” bandwagon. They vigorously wave their “fresh fruit and vegetable” banners while ignoring the 13,000 odd food products on our shelves that presumably have absolutely no bearing on our population’s health. Take bread for example, a staple for most households, containing emulsifiers. Emulsifiers have recently been linked with intestinal inflammation, inflammatory bowel disease, weight gain and metabolic syndromes such as cardiovascular disease and type 2 diabetes. I wonder if Street was aware of this when she confidently alluded to us all being well schooled enough in what constitutes processed foods to make good food choices? Or indeed while she was championing for supermarkets, as if nationwide dietary issues were nothing more than a matter of misplaced self-control? I’m going with a no, because most people, including Street it appears, largely accept that what is on the shelves of our supermarkets is generally okay for us. Otherwise why else would these products be there? Right? I used to retail adult products. While researching the market I learned that the majority of adult toys were made from a jelly PVC. For those who don’t know, PVC is a rigid material, to make it more pliable, chemical plasticisers are added to it. Over time these chemicals; most often toxic tend to breakdown and leach toxicity from the end product. One often used plasticiser by the name of ‘Phthalate’ is a known ‘endocrine disruptor’, meaning it affects the reproductive system; it is also a known cause of cancer. Phthalate is often the first choice for manufacturers because it is cheaper than other plasticisers. Longstanding concerns about phthalate use had already led to the banning of phthalates in the manufacture of children’s toys and pet chew toys. Other industries such as; medical plastics, food packaging plastics, clothing and cosmetics manufacturers were beginning to voluntarily move away from using or severely limiting the use of phthalates. But it was not just plasticisers that were causing concern. Some of you may remember a few years ago issues were raised over a plastic commonly used in the manufacture of baby bottles and bottled water containing ‘bisphenol A’ (BPA), another known cancer causing chemical which could break down and be released when the bottles were heated. Authorities were advising consumers to not leave plastic water bottles in the sun, particularly in vehicles, a common habit, where temperatures could quickly escalate on a hot day. Parents were advised to switch to ‘BPA free’ baby bottles where possible. In these instances BPA chemicals if leaching, were doing so directly into food sources which is problematic at the very least. Learning about the use of phthalates and other toxic materials in adult products, I began seeking any relevant legislation regarding the health and safety of the sale and manufacture of adult (toy) products in New Zealand. To my dismay I found that there were none. The only governance I could find (outside R18/adult retailing restrictions) related to ‘novelty products’. Because adult toys are generally labelled ‘novelties only’, the only criteria they had to meet, even though there was no denying their intended use, are that they complied with basic safety standards for ‘novelty products’, such as “no sharp edges”. Worse still, some global manufacturers were labelling products as ‘non-toxic’ despite independent tests showing the products used any number of suspect chemicals in their manufacture. Retailing by ‘party plan’ meant I could speak to groups of women (generally) at a time and educate them to the state of the adult product market while sharing my concerns of it being a largely unregulated industry. Most had taken it for granted that the sale of ‘adult toys’ would have some rules or regulation. The expectation that if something was “on the shelf” so to speak (for purchase), it therefore must have passed some form of safety or standardised testing. Given the intimacy of the items being sold most audiences were appalled to learn this was not the case. To that end, my business was New Zealand’s first, and possibly only, adult company to feature a completely 100% phthalate free product line. Not an easy feat when worldwide, the industry itself was only just beginning to move towards self-regulating. What once was a largely male dominated industry, women were quickly taking over as the number one consumer and products began to reflect that. 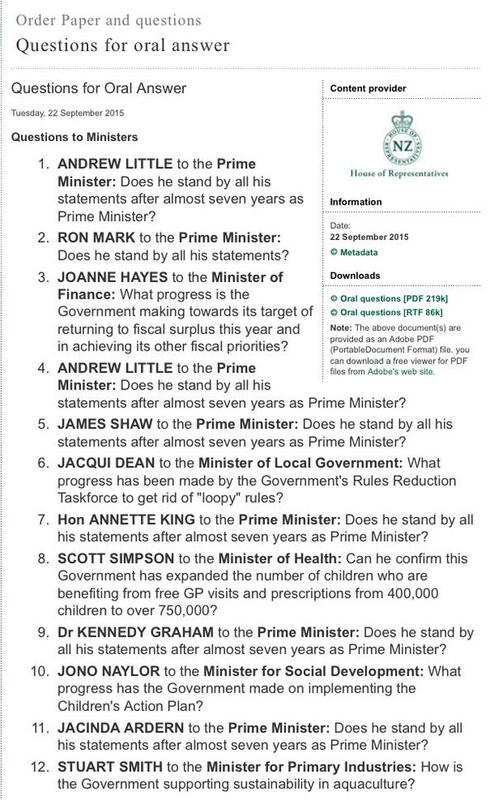 So how does all this relate to personal responsibility, healthy diets, supermarkets and Toni Street? As consumers, we trust that what is been sold to us is the very best that manufacturer or that brand can produce. We assume that they won’t use a cheaper base product with known problems, when a healthier (but possibly more expensive), option is available. 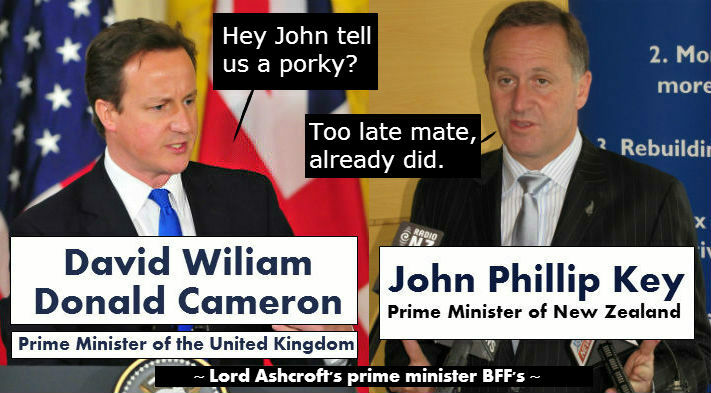 We hope and perhaps wrongfully trust that they are opting for the latter. I mean, we are their customer, their bread and butter, and they say they care for us. That’s what their advertising, their marketing tells us. We buy into their brands and their ethos. They tell us its ‘organic’, we have no reason not to believe them. They tell us its “fat free”, until more recent times, we had no reason to know “fat free” actually meant ‘laden with sugar’. It’s not like “fat free” emblazoned across packaging has ever been replaced with “diabetes in a box”. Change on our supermarket shelves however could be slow to nonexistent when we consider a large number of these processed and ultra-processed items are actually manufactured ‘house brands’ by the supermarkets themselves, in New Zealand’s case, Foodstuffs and Progressives – the very entities Street was suggesting we stop pointing fingers at – she could have been speaking straight out of a Mike Hosking play book, and they’d both be wrong. Supermarkets bosses do have the power to change what is on our shelles. The question is, with regulation, do they have the desire? They could, as Dr Waterlander suggests limit processed foods for example, or cut back on shelf space for ultra-processed products. But why would they do that if their companies are manufacturing a not insignificant number of these product lines? Supermarket house brands also often push out other products. House brands also employ vertical integration, meaning they can control every processes of a product’s manufacturer. Not only do they push out products from their stores, they push our other manufactures from sourcing raw materials, eg the potato grower to frozen potato goods. I wouldn’t imagine any talk of labelling or limiting processed and ultra processed food for consumers benefit would be welcomed either. What could our supermarket shelves look like if consumers and governments demanded a low limit of processed food lines? Could limiting ultra processed and processed foods have not just beneficial nutritional spinoffs but local manufacturing ones as well, including jobs? Shelf space in supermarkets is highly competitive, dominated by global big names and house brands and often local manufacturers struggle to get a foot in the door, let alone finding optimal shelf placement when they do. 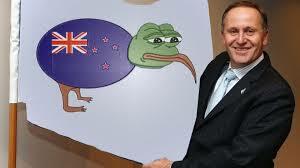 We currently have a government pushing for national identity. Yet what’s speaks more to national identity than the very foods we nourish ourselves with? What shouts we back ourselves better than ensuring a more competitive playing field for local and niche product producers in one of our biggest consumer markets? What says we believe in ourselves more than our brands on our shelves for tourists to fall in love with and want to take home with them? 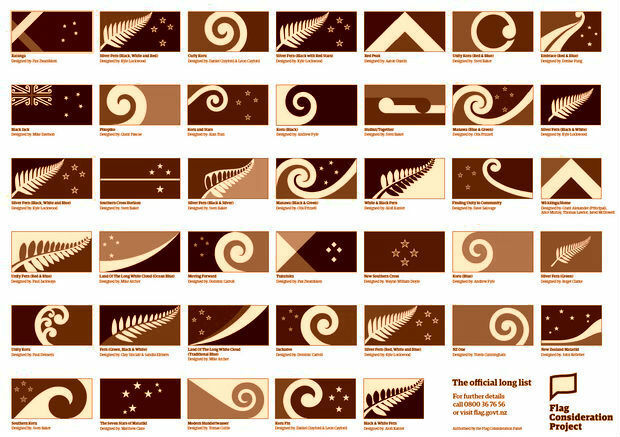 It’s not like the world can eat our flags Mr Key. So the next time Street or anyone wishes to impart any more wisdom from their navel, I suggest they run it past someone who has a clue first. 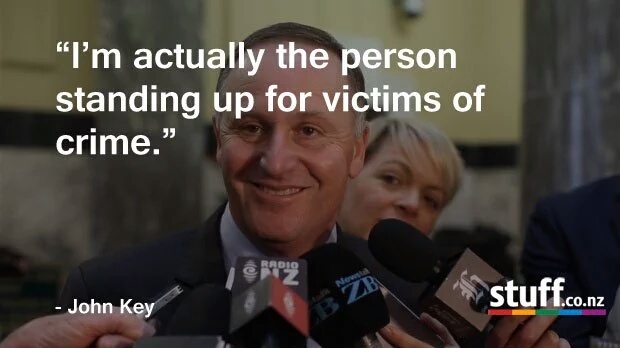 For it is quite clear the findings of the research that came out of the University of Auckland yesterday and the subsequent discourse was completely beyond Street. If you’re going to put yourself out there is a voice of reason that people can trust, it pays to ensure they actually can. 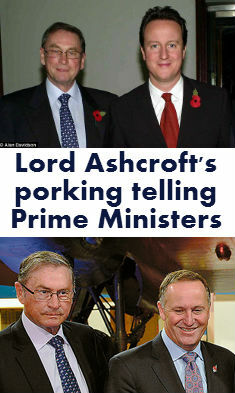 In this instance supermarket bosses are exactly who we should be pointing fingers at. They are the gatekeepers to the country’s pantries.